Central Vermont at Palmer, Massachusetts—July 1986. I exposed this view of Central Vermont GP9s on Kodak 120 Tri-X Professional, a film that came with an ISO rating of 320 compared with 400 for the off-the-shelf variety. This was CV’s southward road freight number 444 which terminated at the Palmer yard, south of the crossing with Conrail’s former Boston & Albany. I made this image on July 23, 1986; the previous day Conrail began its single track operation of the Boston Line by cutting-in CP83 and CP92, removing one track from service and thus ending directional double-track operation (rule 251) between those two points. Close examination of this photo will show that the old westward main track is cut short of the CV crossing. 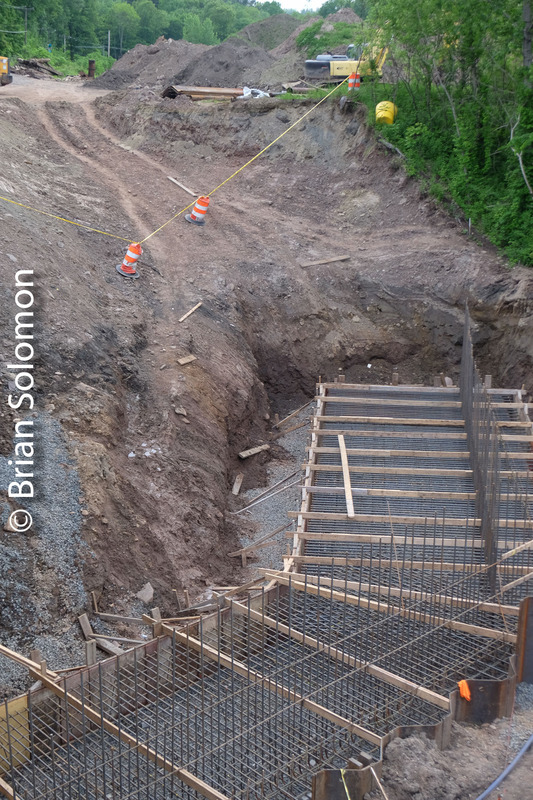 This is a much enlarged scan of the above photo to better illustrate the single-track section over the Palmer diamond. This was one of many photos I made around Palmer during the single tracking of the B&A route. Today the CV route is operated by New England Central, and the Boston & Albany line is CSX. There were far fewer trees by the tracks back in 1986. Pup on the old Boston & Maine: SW1 at Holyoke—August 1987. Classic photo from my archives: In the late 1980s, I’d buy film from Frantek in South Hadley, Massachusetts. This was across the Connecticut River from Holyoke. Typically on my way back with a fresh load of film, I’d seek out the Boston & Maine, which would often have a switcher working the Holyoke yard or on industrial sidings. I made this photo on a bright August 1987 morning using my dad’s Rollei Model T with super slide insert. My film choice of the day was the recently introduced Kodak T-Max 400 in 120 format. Guilford had just repainted this old Boston & Maine SW1 into its company livery and lettered it for its operating entity Springfield Terminal. The SW1 was colloquially known as a ‘Pup’ because it was a small switcher type. The view is looking toward Springfield with B&M’s Connecticut River bridge just beyond the factories. 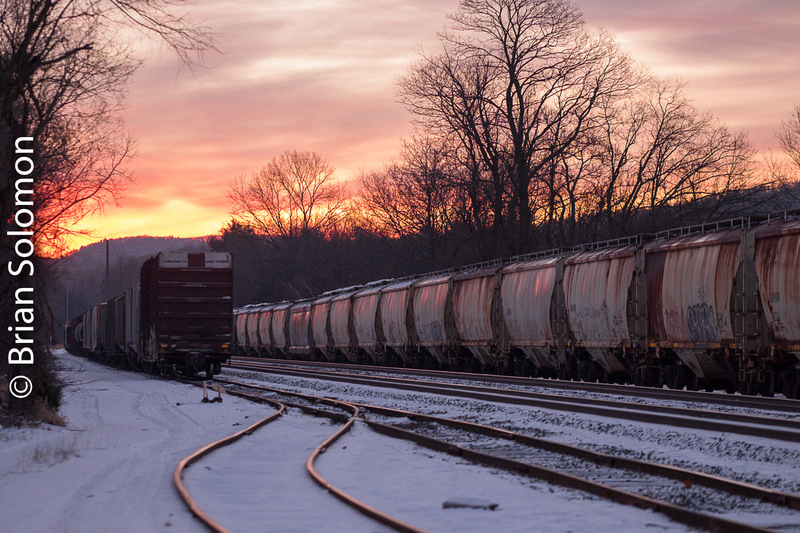 CSX Q264 Meets Sunrise at East Brookfield. This is a follow up to last week’s post: February Sunrise and Headlight on the Horizon. (see: http://briansolomon.com/trackingthelight/2019/02/06/february-sunrise-and-headlight-on-the-horizon/). A week ago, on Wednesday February 6, 2019, Paul Goewey and I caught CSX’s Q-264 rolling through CP64, the interlocking at East Brookfield near the train’s terminus on the East Brookfield & Spencer Railroad (the local short line switching railroad that unloads the autoracks for regional distribution). Working with my FujiFilm XT1 and 90mm lens, I exposed this view at ISO 800. I also made a grab shot with my Lumix LX-7. February Sunrise and Headlight on the Horizon. This morning, February 6, 2019, my photography began with this westward view at CP64 in East Brookfield, Massachusetts. ‘Headlight!’ I announced, as I watched the sun tickling the distant hills. Exposed digitally using a FujiFilm XT1 with 90mm lens. Paul Goewey and I anticipated the passage of an eastward CSX autorack train. Sometimes the thrill of photography is that distant twinkle on the horizon and wondering how it will play out. Millers Falls High Bridge—Two Views. Why make one photo and when you can get two? I like to work with more than one form of media. In this instance, New England Central’s southward 611 (Brattleboro to Palmer turn) was crawling across the antique Millers Falls Highbridge in its namesake Massachusetts town. My vantage point was the 2007-built Route 63 highway bridge. This is more than a century newer than the parallel railway span. First I exposed a burst of digital photos using my FujiFilm XT1 fitted with 90mm lens. Then I made a single black & white photo on HP5 using a Nikon F3 with 50mm lens. By design the black & white view is textured. I realize that black & white doesn’t appeal to everyone, yet I’ve worked in black & white for my entire life, and I often find my traditional film photos more interesting to look at than the digital images. And that is why I do both. CSX on this day Five Years Ago-November 2, 2013. Five years ago today, I made this view of a westward CSX autorack train on the old Boston & Albany near mp 67 from Route 148 in Brookfield, Massachusetts. This was exposed digitally using my Canon EOS 7D with a fixed focal length 200mm ‘prime’ lens. This view is the camera produced JPG, scaled for internet presentation. 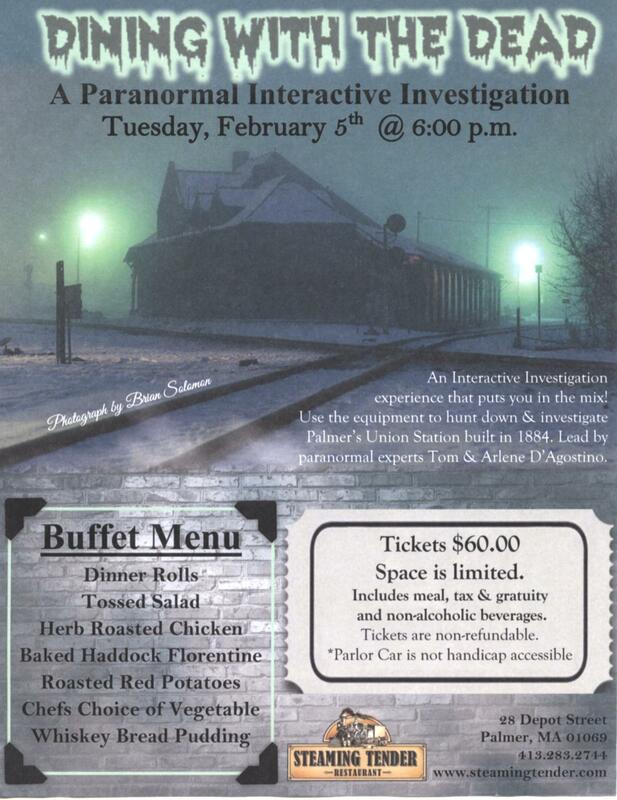 Palmer, Massachusetts’s Steaming Tender restaurant has featured my photo in a recent poster advertising a Paranormal Interactive Investigation to be held at the old Union Station building on February 5, 2019. Steaming Tender’s advertising poster. My photo was reproduced with permission. I made the original photo on Kodachrome in 1992 using my Nikon F3T with 105mm Nikkor lens mounted on a Bogen 3021 tripod. This scan of the original color slide was used to promote my Silver & Steel photo exhibition. 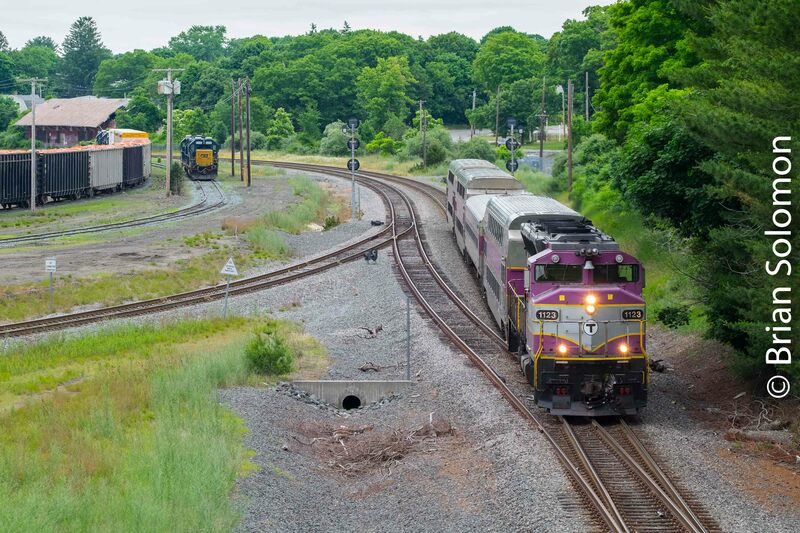 It was July 6, 2015, three years ago, that Paul Goewey and I photographed New England Central at Springfield Street in Belchertown, Massachusetts. Our vantage point is from the old Central Massachusetts Railroad right of way—a line that was abandoned in the early 1930s, when Boston & Maine obtained trackage rights over the parallel Central Vermont (now New England Central) line. On this Day, July 6, 2015, I caught Connecticut Southern 3771 leading the southward New England Central 611 at Springfield Street in Belchertown, Massachusetts. I made this view using my FujiFilm X-T1. Memory and MBTA at Middleborough. It had been a very long time since my last visit to Middleborough, Massachusetts— decades. I made these views of an outbound MBTA from the Route 28 overpass south (west?) of the old New Haven Yard. Exposed using a FujiFilm X-T1 with 90mm telephoto. Dull summer overcast lighting is just as I remembered it, but the scene is so much changed there was little else to correlate this view with that in my memory, except for the old New Haven Railroad freight house in the distance (upper left). I wonder if that will be there next time? This tighter view focuses on the MBTA train. Palmer’s Busy Bright Morning—four new photos. The day dawned clear and bright. I spent an hour at CP83 in Palmer making good use of the light. The railroads cooperated and supplied a parade of eastward trains, and these favored the sun for classic views. I’ve made countless thousands of photos at Palmer, Massachusetts, but it’s always nice to keep the files fresh. 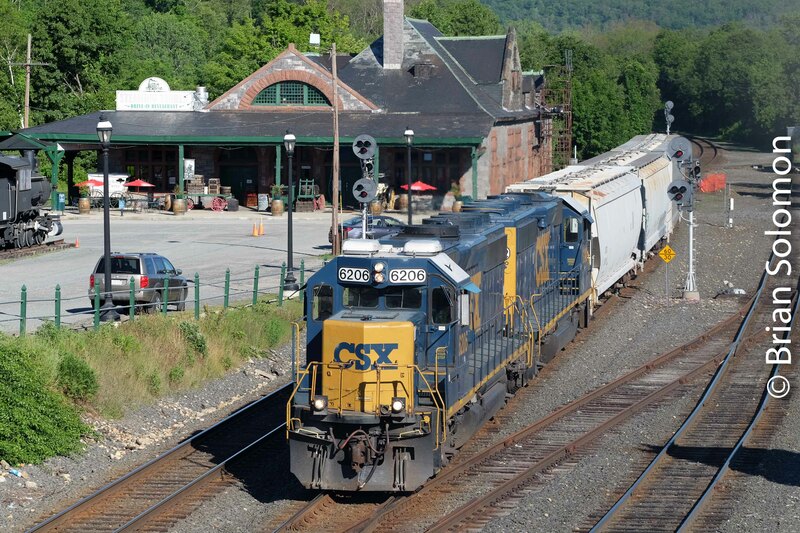 CSX eastward intermodal—probably Q012—passes the signals at CP83 in Palmer, Massachusetts. Exposed using a FujiFilm X-T1 with 90mm telephoto lens. New England Central GP38 3845 works a local freight on the interchange track. Moments after New England Central’s local disappeared from view, CSX’s B740 arrived with cars for interchange. (exposed at f5.0 1/640 ISO 200) It was about this time that things got interesting! Stay tuned for more. Soon the scene is likely to change since CSX is installing new equipment for its positive train control signaling, and this will likely result in new signal hardware in place of the Conrail-era signals installed during single-tracking in 1986-1987. Then something unexpected happened, and by shear luck I caught a rare move! Stay tuned for Part 2. Brian Solomon’s Tracking the Light Posts Every Day. 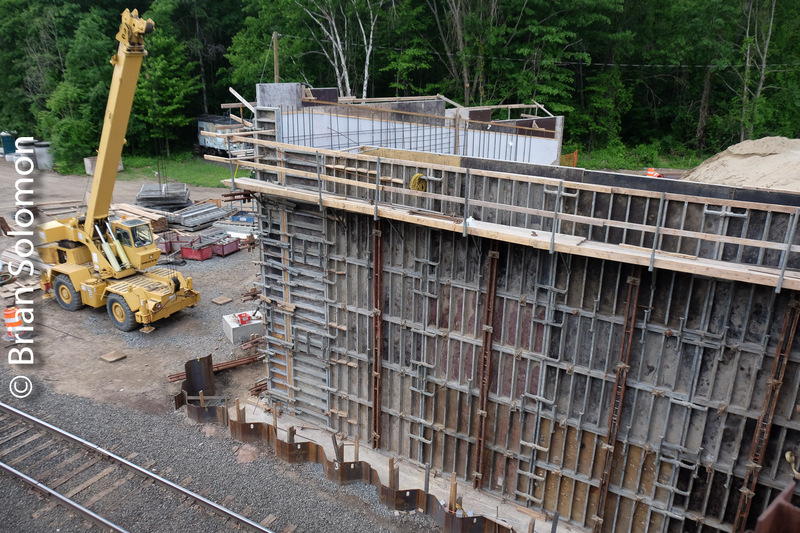 East Deerfield New Bridge—June 2018 Up Date. We called it the ‘waste too much film bridge’. How many thousands of photographs have been exposed from the old bridge at the west end of Boston & Maine’s East Deerfield Yard? The new bridge is progressing. I made these photos a few days ago. Old and new bridges at McClelland Farm Road, East Deerfield, Massachusetts. As mentioned in an earlier post, a new pole-line has been erected to the east of the old bridge that threatens to ruin photographs. How will this ultimately affect views from the new bridge? Suitable vantage points are key to making good photographs, so I’m curious to see what the new bridge offers. If it turns out to be of little use, I’ll need to find new vantage points. South approach to the new bridge. 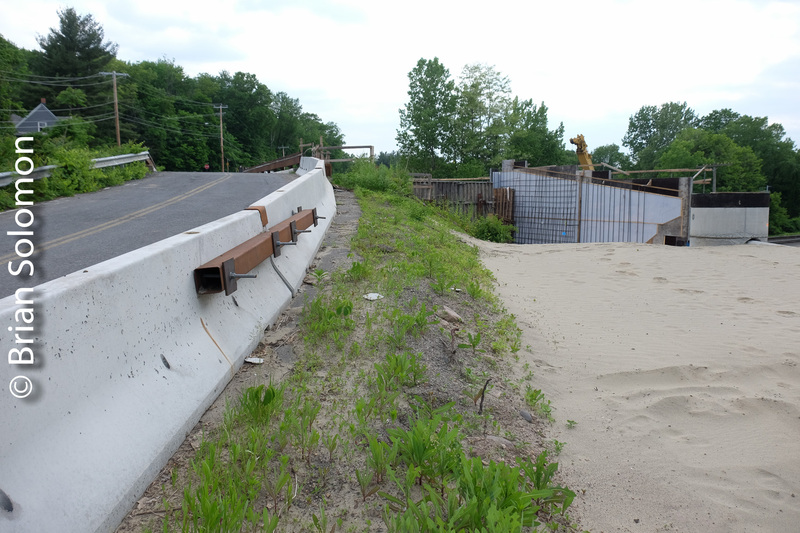 North abutment with Pan Am tracks in foreground. Looking west from the old McClelland Farm Road bridge. FujiFilm X-T1 photo -in-camera panoramic composite image. Winter at Bridge Street, Monson. Over the years I’ve made many photos of southward trains ascending State Line Hill from Bridge Street in Monson, Massachusetts. This one was exposed in January 2018, shortly before I left for Dublin. 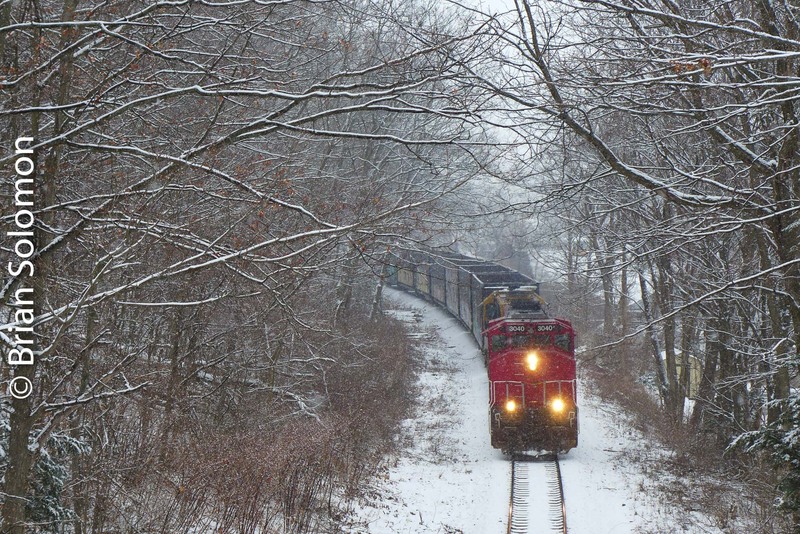 Lightly falling snow and a red GP40-2L made for a Christmas card scene. 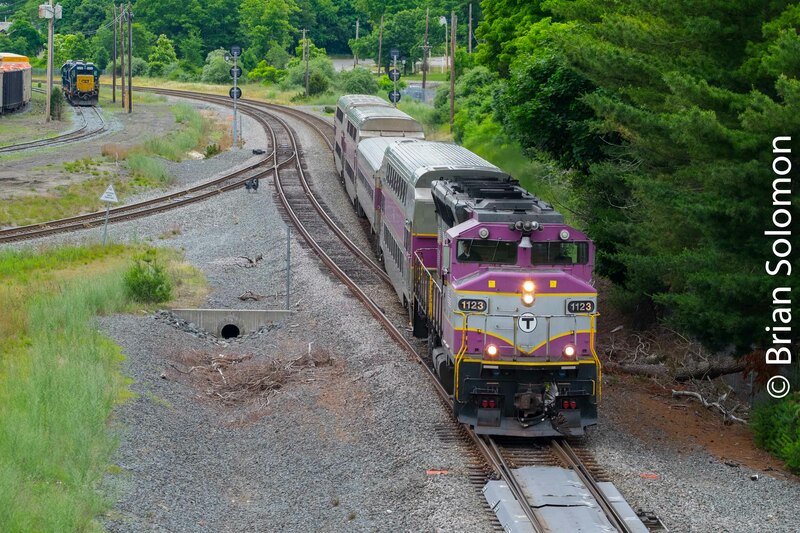 This is New England Central job 608 on its return run on the old Central Vermont Railway line to Willimantic, Connecticut. Compare this winter view with those made in Spring 2017, See: Bridge Street Monson—Two Takes, Four Views. Exposed digitally using a Lumix LX7. January 2018 Sunrise—The Day was Only Beginning. Red sunrise means you’re going to have a good day. Right? Or was that a red sunset? Anticipating drop-under at Tennyville, Palmer, Massachusetts, January 3, 2018. Looking east on the old Boston & Albany. Tennyville, Palmer, Massachusetts, January 3, 2018. And yes, it was cold. Western RailRoad of Massachusetts; Boston & Albany; New York Central System; Penn Central; Conrail; CSX. CSX is the current operator of the Boston & Albany route. I made this photo earlier this month of train Q263 westbound at Muddy Pond approaching Washington Summit . Exposed digitally using a FujiFilm XT1 with 18-135mm Fujinon zoom lens. In recent years CSX freight volumes over the B&A route have been declining. Saturday (December 16, 2017), we learned that Hunter Harrison, CSX’s Chief Executive Officer passed away. I can’t help but wonder what will become of the B&A, and how Hunter’s controversial strategies have affected this route in the few months he was at the reigns of CSX. 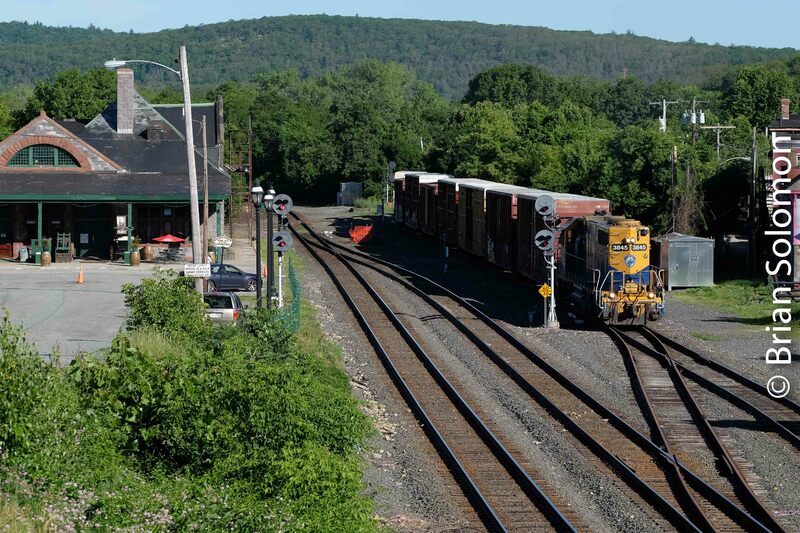 In June 2016, I posted on Tracking the Light some views of the Housatonic Railroad at Housatonic, Massachusetts (located along the Housatonic River). In November 2017, I returned to this location in advance of the approaching northward Housatonic freight NX-12 that featured two early 1960s-era GP35s in the lead followed by 32 cars (28 loads, 4 empties) and another GP35 at the back. I find the railroad setting here fascinating. The combination of the traditional line with wooden ties and jointed rail in a setting of old factories, freight house and passenger station makes for a rustic scene out of another era. Working with a Nikon F3 with 50mm lens I made a series of black & white photos on Kodak Tri-X. And, I also exposed a sequence of digital color photos using my FujiFilm X-T1. Freight house at Housatonic, Massachusetts. Exposed on Tri-X with a Nikon F3 fitted with a 50mm Nikkor lens. Film processed in Kodak D76 1-1 with water for 7 minutes 20 seconds at 68F. Freight house and factories, looking north from the westside of the tracks. In today’s railroad world, this scene is decidedly rustic. Digital color photo exposed with a FujiFilm X-T1. RAW File processed in Lightroom with contrast adjustment to improve shadows and highlights. Tri-X black & white photo of Housatonic Railroad freight NX-12 working northward. Digital color photo exposed with a FujiFilm X-T1. RAW File processed in Lightroom with contrast adjustment to lighten shadows and control highlights. Tri-X photo with 50mm lens. Digital color photo exposed with a FujiFilm X-T1. Fuji Velvia color profile; camera Jpg scaled for Internet. Sunburst on the Boston & Maine. So what do you do in a situation where a train is coming directly out of the midday sun? 2) go for a sandwich. 3) take up plane spotting. Or you can try something different. The other day at Millers Falls, Massachusetts I exposed these views looking timetable west on the old Boston & Maine. Train 28N is an eastward autorack destined for Ayer, Massachusetts. Using a super wide-angle 12mm Zeiss Touit, I set the aperture to the smallest setting (f22), which produces a sunburst effect. To make the most of this effect, I positioned an autumn branch between the camera and the sun. 12mm Zeiss Touit, ISO 800, f22 at 1/125th of a second. Night and No Tripod, Improvise! 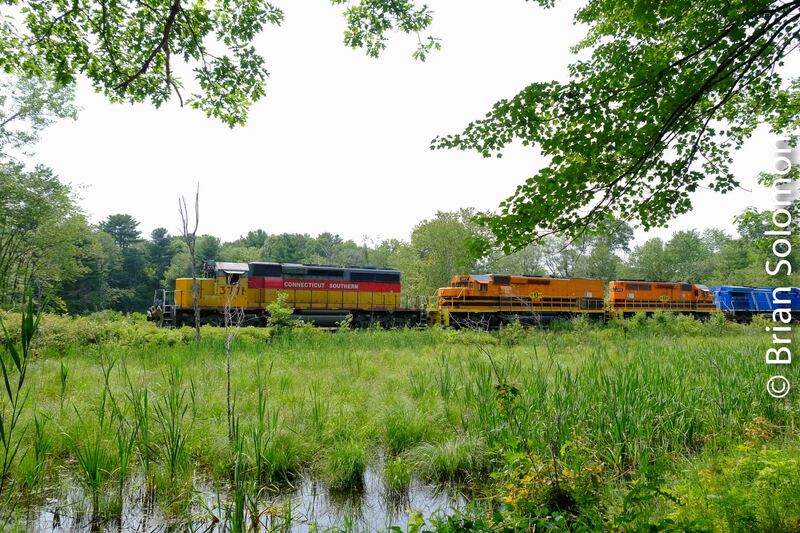 -There’s a long history among my friends to meet in Palmer, Massachusetts on Friday nights; first some dinner and then over to CP83 to watch trains. A few weeks ago some of the gang met, and CSX rolled through a few long freights. I had a Nikon F3 with 24mm lens loaded with Kodak Tri-X, so despite my lack of a tripod, I exposed a few photos. My exposures ranged between 2 and 8 seconds at f2.8 hand-held. I rested the camera on the short disconnected section of track used to display a Porter 0-6-0 steam locomotive by the Steaming Tender; thus my camera support became part of the photos. Long exposures hand-held are not easy. I processed the Tri-X in Ilford Perceptol 1:1 at 69F for 8 minutes 30 seconds, and following stop, first fix, second fix, extended rinse cycles, I then toned the negatives in a selenium solution for 8 minutes and repeated the wash sequence. Negatives were scanned using an Epson V750 Pro flatbed scanner. Overcast Afternoon at East Deerfield—June 29, 2017. The McClelland Farm Road bridge over the Boston & Maine tracks at the west end of East Deerfield Yard (near Greenfield, Massachusetts) has been a popular place to photograph trains since the steam era. Work has begun to replace this old span with a new bridge to be located about 40 feet further west. It’s at a hub; because of the bridge’s location at the west-end of Pan Am Railway’s East Deerfield yard, there tends to be a lot of action and opportunities to witness trains here. While waiting along the line can become tiresome, if not tedious, but there’s often something about to happen at East Deerfield. 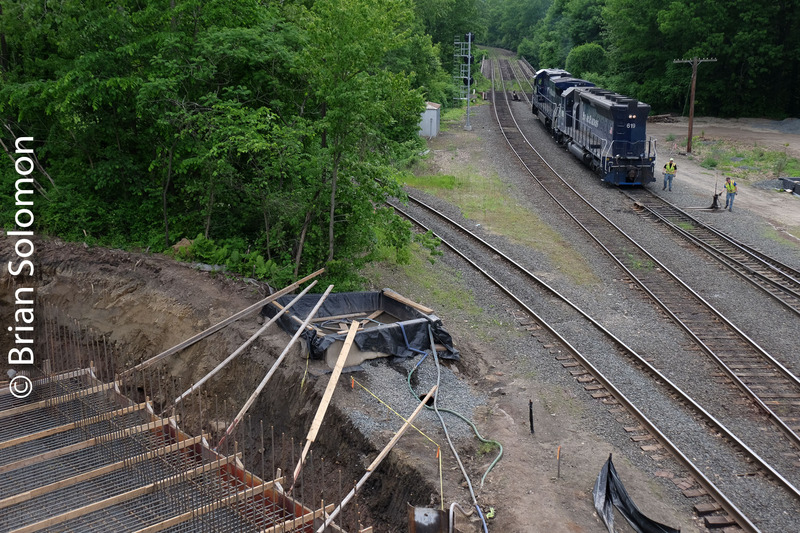 The location above crossovers at the throat to the yard, this combined with yard leads and engine house tracks, plus the junction with the Deerfield Loop (that connects with the Connecticut River Line) west of the bridge make for some fascinating track work. Elevation is always a plus. The light in early morning and late evening here can be excellent. I’ve made some wonderful fog photos here, as well countless morning and evening glint shots. How about blazing foggy glint? Yep done that here too. And about ten days ago I got a rainbow. The afternoon of June 29, 2017 was dull and overcast. Mike Gardner and I had arrived in pursuit of Pan Am Southern’s symbol freight 28N (carrying autoracks and JB Hunt containers). We’d also heard that its counterpart 287 (empty autoracks from Ayer, Massachusetts) was on its way west. As it happened the two trains met just east of the bridge. I exposed a series of black & white photos on Kodak Tri-X using a Leica IIIa with 21mm Super Angulon lens, while simultaneously working in digitally color with my FujiFilm X-T1 with 90mm lens. Photographer Mike Gardner on the famed ‘Railfans Bridge’ at East Deerfield. Pan Am Southern’s symbol freight 28N with a Crescent Cab approaches East Deerfield Yard. Auto racks roll under McClelland Farm Road at East Deerfield West. Pan Am Southern 28N (left) meets its counterpart, symbol freight 287 at East Deerfield yard. One of the attractions of the East Deerfield bridge is the action. Too many photos here? Undoubtedly. But I bet they age well. Especially when the old vantage point has finally been demolished. These days most of CSX’s scheduled through car-load freights tend to traverse the east end of the old Boston & Albany during darkness. True, there’s a couple of intermodal trains, and Amtrak’s Lake Shore Limited during the day, but if you want to see an old-school freight train in daylight you’ll have a long wait. Early in the morning of June 23, 2017, I went over to CP83 (control point 83 miles from South Station) on spec to see if I could catch some freight on the move. I have a sixth sense or really good hearing (or both), because I stepped out of the car, and I could hear a distant freight with GE diesels laboring toward Palmer. I fitted my FujiFilm X-T1 with my fast (f2.0) 90mm lens and walked up to the South Main Street bridge, where I’ve made hundreds of photos over the years. As the train approached, I realized that it wasn’t an intermodal train, as I expected, but a carload freight. It was CSX’s Q422 (Selkirk, New York to Worcester, Massachusetts). At 5:29am I made these photos with my camera set to ISO 800, f2.2 1/250 second handheld. The ability to raise the ISO to a faster (more sensitive) setting combined with my fast telephoto lens allows for photos like this one. ISO 800, f2.2 1/250 second handheld. In my old Kodachrome 25 days, my exposure with my Nikon F3 and f2.8 135mm lens (offering an equivalent focal length to the 90mm with the small sensor on the X-T1) would have been: f3.5 at ¼ second. The resulting image of this moving train would have been dramatically different. MBTA in the Summer; a Lesson in Midday High-Light. For the discerning photographer, summer midday high-light presents difficulties with contrast and deep shadows. In my Kodachrome days, I’d put the camera away from 10 am to after 2 pm during June-July. Kodachrome’s palate and contrast didn’t work with midday high-light and the slides would suffer from inky shadows, exceptionally harsh contrast, and bleached highlights. Using digital photography and post processing, I can overcome some of the difficulties presented by summer high sun by adjusting color temperature and carefully controlling highlight and shadow detail. Another tool is the external graduated neutral density filter. By attaching one of these filters to the front of the lens, I can darken the sky to better hold highlight detail and color saturation, while lightening the lower portions of the image area to make for a better balanced exposure and increasing the relative amount of data captured. Final adjustment is still required in post processing to lighten shadows. MBTA train 1403 from North Station, Boston passes Shirley, Massachusetts. I’ve lightened the shadows and controlled the highlights to make for a better balanced image. The lighting is still straight up, but the effect is less objectionable. In both this view an the above image, I’ve used a graduated neutral density filter to hold sky detail and color saturation. In this view high clouds have slight softened the sun at MBTA’s Wachesett Station. This scene would have been a nightmare with Kodachrome. Bright whites in the foreground, dark green trees at the sides and noon time sun! Exposed digitally using a FujiFilm X-T1. Years ago I’d ride my ten-speed bicycle to the Stafford Hollow Road Bridge in Monson, Massachusetts. 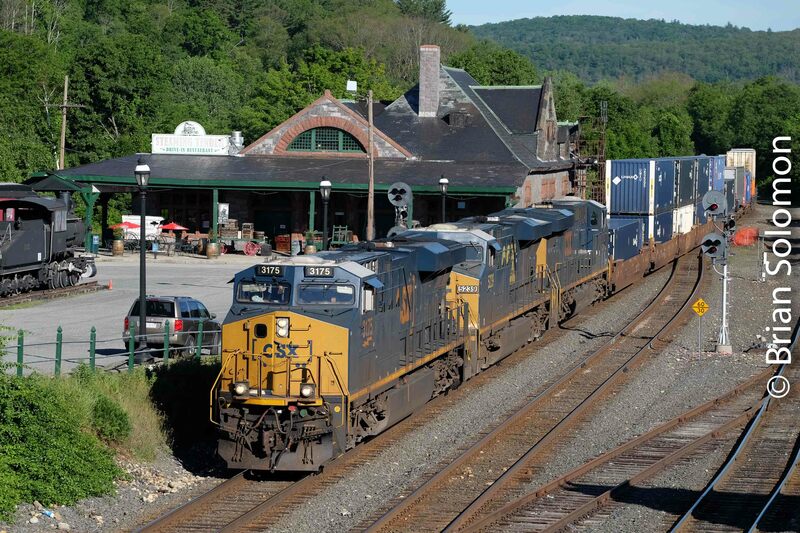 I’d wait for Central Vermont’s freight to New London. If I was lucky, I’d catch CV working upgrade with GP9s/Alco RS-11 making a healthy roar as they approached Stateline Summit. 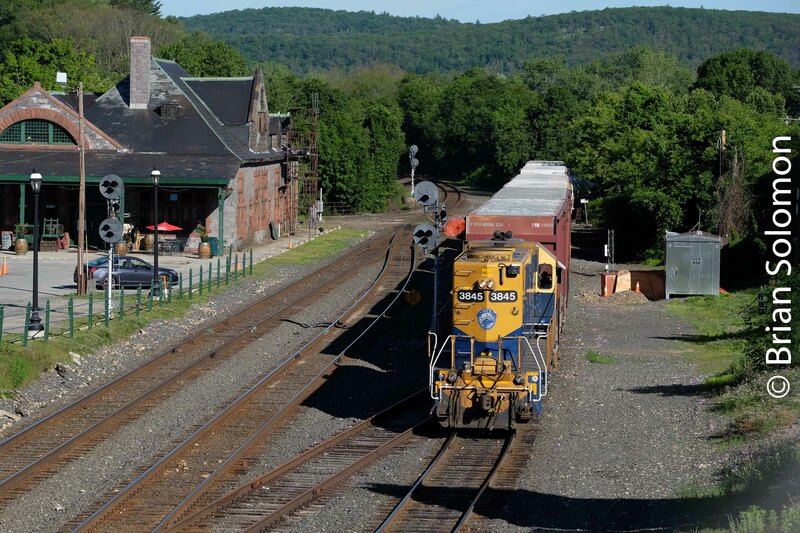 On the morning May 31, 2017, I was leaving the Monson Post Office (having just mailed a letter to Ireland) when I heard New England Central 608 (running south from Palmer to Willimantic) tackling the grade in town. I was surprised to see a Providence & Worcester GP38-2 in the lead. I supposed since New England Central and P&W are now both in the Genesee & Wyoming family it makes sense that the locomotives of these two connecting lines would get a bit mixed up. Regardless, I knew that this would make for an interesting photograph. Among the places I caught 608 was at my old Stafford Hollow Road location. My late friend Bob Buck had photographed here since the 1940s and always called the location ‘Smith’s Bridge’. I know he would have been delighted to see these photos of a P&W GP38-2 leading the southward freight. Beacon Street, Boston MBTA’s Green Line, May 2017. On May 6, 2017, I made a few rainy afternoon photos of Boston’s Green Line streetcars along Beacon Street. These were exposed old school; a Leica IIIa loaded with Ilford HP5, exposure calculated using a hand-held Minolta Mark IV light meter. In these views, I’ve divided up my frame to account for the white sky and the effect of contrast and tonality. Do you think these photos would work in color? Beacon Street, Boston MBTA’s Green Line, May 2017. Ilford HP5 processed in Perceptol (mixed 1-1) at 70 F for 13 and one half minutes plus 6 minutes in selenium toner (diluted 1 to 9 with water). Ilford HP5 processed in Perceptol (mixed 1-1) at 70 F for 13 and one half minutes plus 6 minutes in selenium toner (diluted 1 to 9 with water). South Station, Boston, Massachusetts—in B&W and Color. I rarely travel with just one camera. These days, I typically have at least one digital camera and a film camera loaded with either black & white or color slide film, plus a back-up instant photo capture/transmitter that subs as a portable telegraph, mobile map, music box, and portable phone. On my May 6, 2017 visit to South Station with the New York Central System Historical Society, I made a variety of color photos using my Lumix LX7, and traditional black & white photos with an old Leica IIIa loaded with Ilford HP5. So! Do you have any favorite photos from this selection? Which camera do you feel better captures Boston’s South Station? Leica IIIa photo on Ilford HP5. Do you remember when Worcester Union Station was a decaying ruin? Thankfully the old station was restored in the late-1990s. I made this view on January 31, 2017 using my Lumix LX7. Tracking the Light is on autopilot while Brian is traveling. This old PCC—memories of another time. In October 2014, I photographed this old MBTA (Boston) PCC car at the Connecticut Trolley Museum at East Windsor, Connecticut. Just a rusty old ruin; but the car and its Kenmore destination board, brought me back to the early 1970s when my family lived a few blocks from MBTA’s Riverside Line at Newton Centre. This route had been the Boston & Albany Highlands Branch, and was converted to a trolley line in 1960. As young child, I was permitted freedom to wander around the neighborhood. My fascination with railways naturally brought me to the trolley line. One afternoon, I’d been watching the PCC’s coming and going in front of the old B&A station. I’d often traveled on the cars with my parents, and I understood how the system worked. Mass-Central at Gilbertville—an example of digital photography. I find one of the great benefits of digital photography is the ability to carry a high-quality imaging machine with me at all times. Also, other than the initial investment, the relative cost of individual photos is inconsequential. As result, I’m unhindered by weight or cost in the seeing and making of photos. Does this make for better images? Not necessarily, but it facilitates me to make a more complete record of my travels and capture ordinary scenes such as this view of the Mass-Central at Gilbertville, Massachusetts on a brilliant October 2014 afternoon. Looking south on the old Boston & Albany Ware River Branch at Gilbertville, Massachusetts on October 14, 2014. Lumix LX7 photo. In the Dark: 30 Seconds, Five Years Ago. 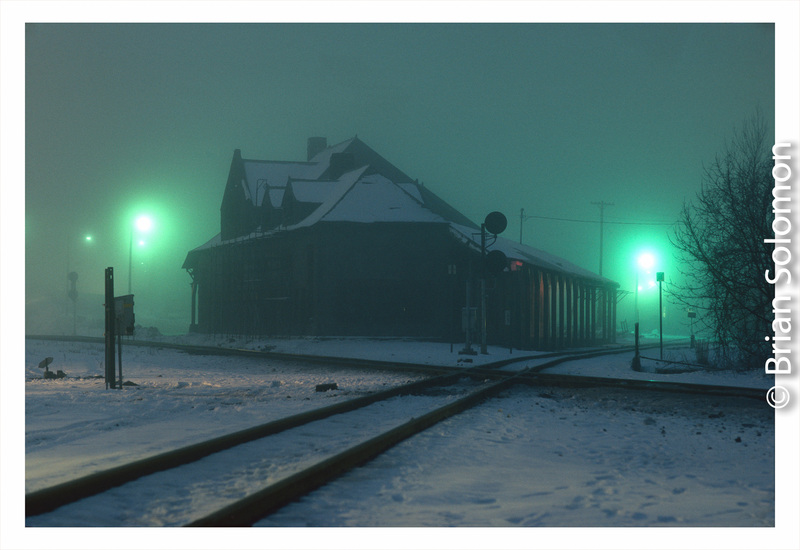 On February 25, 2012, I exposed this 30-second exposure at New England Central’s yard in Palmer, Massachusetts. I mounted my Lumix LX7 on heavy tripod, and actuated the shutter using the self-timer to minimize vibration. Note the effect of the clouds moving. This is a scaled JPG made from the unaltered Lumix LX3 JPG file. By adjusting exposure and contrast in the RAW file I was able to produce this improved version. Notice the detail in the shadow areas that was lost in the JPG. Despite the long exposure, the resulting digital image was still too dark and required work in post-processing using Lightroom. In addition to lightening shadow areas, I also lightened the entire exposure by about full-stop, while controlling highlights and softening overall contrast. An old favorite photo location is the Connecticut River bridge at East Deerfield, Massachusetts. Earlier this month, photographer Mike Gardner and I caught two freights crossing this traditional span within just a few minutes of each other. The first was eastward autorack train symbol 28T operating to Ayer, Massachusetts with Norfolk Southern locomotives. A few minutes later, Pan Am freight POED (Portland to East Deerfield) worked west with recently acquired former CSX General Electric DASH8-40Cs. Autorack (Norfolk Southern symbol 28T) works east across the Connecticut River. Exposed using a Lumix LX-7. RAW file modified for contrast and color using Lightroom. Pan Am’s POED with former CSX DASH8-40C diesels. Exposed using a FujiFilm X-T1 digital camera. Historically this was the Boston & Maine’s Fitchburg line; B&M was melded into the Guilford system in the 1980s and in the mid-2000s . Today, Pan Am and Norfolk Southern are partners in operating Boston & Maine lines west of Ayer as Pan Am Southern. 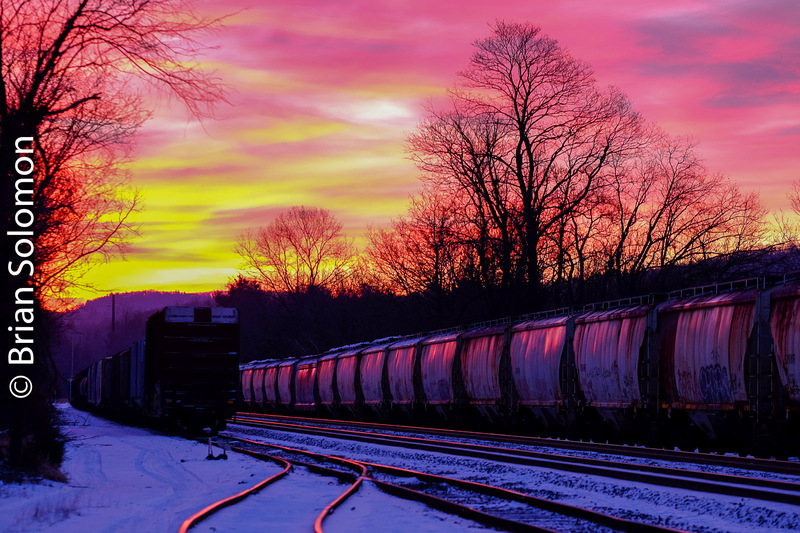 CSX Rolling West after Sunrise. Over the last 39 years I’ve exposed countless hundreds of photos of trains rolling through Palmer, Massachusetts. But that’s not stopped me from continuing the exercise. Friday, December 23, 2016, I was at CP83 near the Steaming Tender restaurant, when the signals lit up: high green on the mainline for a westward move. That was my cue to get ready. The previous day I’d gone fishing through the camera cabinet and found an old Nikkormat FT. Perfect! I loaded this up with some HP5 and set out making photos old school. It had been 20 years since I last worked with Nikkormat. I fitted it with a vintage Nikkor 24mm lens. With this antique in hand I set up a shot by the old Palmer Union Station (Steaming Tender) using the building to partly shade the rising sun. I’d misplaced my handheld lightmeter, so I used my Lumix LX7 to help gauge the exposure. This was a tricky, I wanted the sun light to be set apart from the skylight and normally this requires a bit of underexposure. But I didn’t want the front of the locomotives to become completely opaque. Ideally, I’d want there to be some detail in the shadows. As the headlight of a westward freight appeared to east I was still dithering over my exposure. Ultimately I settled on f11 1/500th of a second. CSX symbol freight Q427 rolls through Palmer on the morning of December 23, 2016. Exposed on Ilford HP5 with a Nikkormat FT and 24mm lens. Notice how I’m just letting the sun peak past the station building. A small aperture (f11) aids with the starburst lighting. I’ve always like the glint effect, and so I made this view of the second locomotive as it rolled by at 30mph. I realize that photographing the second locomotive at speed is a non-standard approach, but it makes for a nice image, does it not? The trick to bring up the shadow detail was more a result of my processing technique. I needed to retain enough detail in the negative to work with, but once that was established on site, the rest of the work was with the chemistry. Before the main process, I prepare a ‘pre-soak’. In this case, I used a Jobo semi-automated processing machine with continuously reversing agitation. My ‘presoak’ bath consisted of about 200ml of water at 74 degrees F (pardon my mixing of measurement standards) with a drop of Kodak HC110 (about 2-3 ml of developer solution), plus some Kodak Photoflo. I let film presoak for about 3-4 minutes. Long enough to let the emulsion swell and for the minimal quantity of developer to become completely exhausted. This has the effect giving the shadow areas proportional more development than the highlights, while getting the processing reaction going. For my main developer, I used Kodak D76 mixed 1-1 with water at 69F for 9 minutes. (This is less than the recommended time of about 11 minutes). Afterwards I scanned the film using an Epson V750 at 4800 dpi. The photos presented here are scaled in Lightroom from my hi-res files. A cropped detailed view of the front of the leading locomotive. This view is intended to show that there is reasonable detail in the shadow areas. If I want to I can enhance the shadow contrast in post processing. No good? Don’t like it? No problem, I can go back and try it all over again! Tracking the Light Discusses Photography Every Day! Central Vermont at the Palmer Diamond—1977. This was one of several photos I exposed with my father’s Leica 3C in Palmer, Massachusetts on Labor Day weekend 1977. I started 6th grade a couple of days later. Significantly, it was the first time I made a photo from this location at the Palmer Diamond, where Central Vermont crossed Conrail’s former Boston & Albany line. From near this spot, I’ve since made many hundreds of photos—more than I dare to count. Grand Trunk GP9 4442 wearing black and orange paint leads a freight across Conrail’s former Boston & Albany mainline. Exposed on black & white film using a Leica 3C fitted with a 21mm Super-Angulon. In November 2016 a CSX intermodal train crosses the Palmer Diamond. This view is made from a spot immediately to the east of my 1977 view. Looking back, I wonder why it took me so long to decide to make photos here. But realistically, prior to summer 1977 my railway photographic efforts were infrequent events. For my birthday that year, my dad gave me my own Leica, a model 3A, which I carried everywhere for the next seven years and with which I made thousands of images from the Maine coast to southern California, and from Quebec to Mexico. Black & White-Morning Light: CSX at Gardner, Massachusetts. But wait, CSX doesn’t serve Gardner. True. However on this day in mid-November 2016, I photographed a pair of CSX GE Evolution-series diesels leading Pan Am Southern freight 287—an empty auto rack train from Ayer. These days, passing locomotives don’t necessarily reflect either the owner or operator of the train they lead. CSX diesels work Pan Am Southern at Gardner, Massachusetts. Dappled morning sun augmented the effects of a textured sky and late season foliage. I opted to make this image using my Leica 3A with 35mm Nikkor Lens loaded with Ilford Pan-F (ISO). This film offers fine grain and broad tonality. I’m not yet expert at processing this emulsion. Previously I used Ilfosol with mixed results. This time I tried Kodak D76 mixed 1:1 (stock solution with water). If my process was completely successful my negatives would scan perfectly without need of electronic post processing adjustments. This example provided a good starting point, but to make for the most pleasing image, still required local and global contrast control. By the way, digital photographers may relax; I also exposed several frames with my FujiFilm X-T1–Just in case. The Lost Waterfall at Bernardston. You never know what’s going to change. Photo exposed on 120 size Ektachrome film. Exposure calculated with a Sekonic Studio Deluxe handheld photocell (light meter). I exposed this view twenty years ago using a Speed Graphic with 120 size roll film back that I’d borrowed from Doug More. A decade earlier, fellow photographer Brandon Delaney had showed me this bridge at Bernardston, Massachusetts on the Boston & Maine’s Connecticut River Line. The bridge survives much as pictured here; today it serves as the route of Amtrak’s Vermonter. However the old mill dam with accompanying waterfall were destroyed sometime after I made this December 1996-view. Tomorrow, I’ll post a contemporary angle of the bridge. All 50 photos were exposed on 25 October, albeit in different years. Palmer, Massachusetts October 25, 1985. Newark, Delaware, October 25, 1991. Marcus Hook, Pennsylvania, October 25, 1991. Near Eddystone Pennsylvania, October 25, 1991. D-Tower Grafton, West Virginia, October 25, 1992. East Grafton, West Virginia, October 25, 1992. Amtrak’s Capitol Limited approaching Cumberland, Maryland on October 25, 1993. CSX near Falls Cut, Pennsylvania on October 25, 1993. Conrail near Middlefield, Massachusetts on October 25, 1996. Conrail west of Chester, Massachusetts on October 25, 1996. Vermont Rail System equipment on passenger special over New England Central near Stafford Springs, Connecticut, October 25, 1998. Cincinnati Union Station on October 25 2002. Sunrise at Palmer, Massachusetts October 25, 2009. East Brookfield, Massachusetts, October 25, 2009. CSX Q264 at East Brookfield, Massachusetts, October 25, 2009. CSX Q168 at Charlton Depot, Massachusetts, October 25, 2009. Islandbridge Junction, Dublin, Ireland on 25 October 2011. 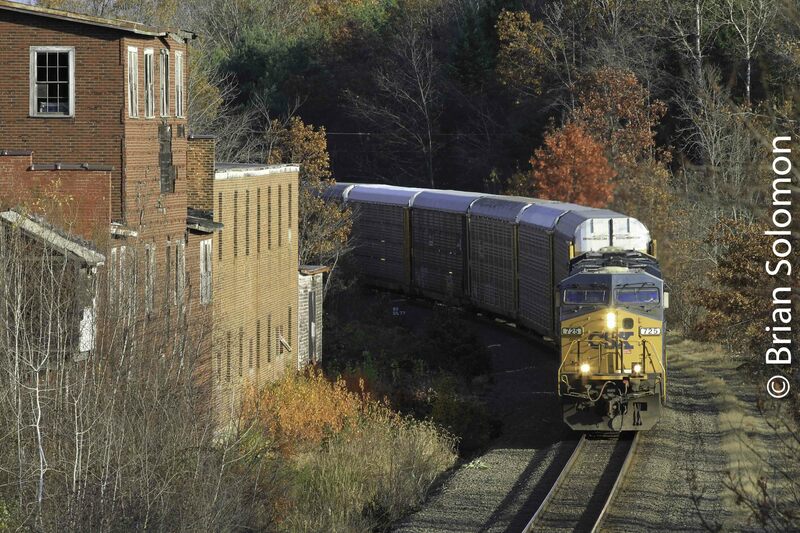 CSX empty ethanol train near Brookfield, Massachusetts on October 25, 2013. Old Boston & Albany yard at East Brookfield, Massachusetts on October 25, 2013. Amtrak train 71 at Hyde Park, Massachusetts on October 25, 2014. MBTA’s Matapan-Ashmont line on October 25, 2014. Amtrak 449 at Auburndale, Massachusetts on October 25, 2014. Irish Rail 231 departs Heuston Station with the 0900 to Cork. 25 October 2016. Irish Rail 29000-seres train passes Seapoint, Dublin on 25 October 2016. Irish Rail drivers training special with preserved Cravens passes Seapoint, Dublin on 25 October 2016. 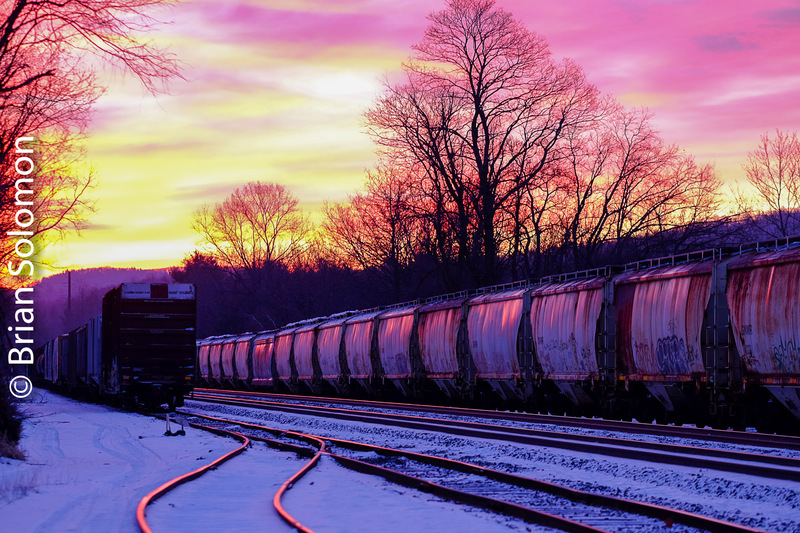 CSX Intermodal catches the First Rays of Sunshine—Middlefield, Massachusetts. Last May (2016), I made this view of an eastward CSX stack train descending the old Boston & Albany grade over Washington Hill. I was just east of the old Middlefield Station (long defunct), where my late friend Bob Buck had exposed some classic images of B&A’s A1 Berkshires. A hill behind me blocks the rising sun, until after 6:30am in May. I could hear the train descending as the first rays of sun tickled the iron. Morning clouds waft across the sky making for inky shadows. Brian Solomon’s Tracking the Light is on auto pilot. Tracking the Light attempts to post daily! (even when plagued by technical faults, internet outages, and an ambitious travel schedule).